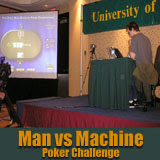 I was reading an email from my boss in London telling me to get down to the Artificial Intelligence Conference in Vancouver just as the first ever Man vs Computer Poker Challenge headlining the event was being featured on the morning TV news. A bunch of computer geeks from the University of Alberta was in town for the Association for the Advancement of Artifical Intelligence annual conference with a computer program they said could beat any poker pro. 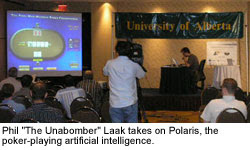 Two well-known professional poker players, Phil “The Unabomber” Laak and “Prince” Ali Esmali were playing against a computer program called Polaris. This I had to see! I knew I’d stepped into some sort of parallel universe the minute I walked through the doors of the Hyatt Hotel where the conference was in progress. There was a laptop charging in every available electrical outlet in the hotel lobby, and all manner of geeks jostled for the best positions for wi-fi reception. When I arrived at the Tournament site, poker pro Phil Laak was about halfway through five hundred hands of poker against Polaris and their chip stacks were about even. The tournament format was designed to reduce the luck element and increase the chances that the match will be won based on skill -- cards dealt in the first match to the human are dealt to the computer in the second match, and vice versa. During the two-day tournament, Laak and Esmali took turns playing against the computer in the public room where a nice little crowd gathered to see if the humans could outwit the computer, while the other played the computer in another room. 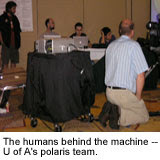 Two years ago at the 2005 WSOP Laak took on and defeated an earlier version of the Polaris software called Poki-X. This time out, the program has more human abilities – it can now bluffs and it can read an opponent’s style of play and adjust accordingly. After a Draw in the first of the four sessions, Polaris won the second round. The humans fired back in the third session taking the teams into the final match tied. Laak and Eslami won the final session by $570 to become the first Champions of the first ever Man vs Machine Poker Challenge. The first official poker competition between humans and computers, organised by the Association for the Advancement of Artificial Intelligence (AAAI), was held in Vancouver, Canada July 22-26. AAAI is is a nonprofit scientific society devoted to advancing the scientific understanding of the mechanisms underlying thought and intelligent behavior and their embodiment in machines. Polaris Team Leader Dr. Jonathan Schaeffer believes this week’s event is an evolution of the 1997 match between IBM's "Deep Blue" chess program and Garry Kasparov, the world chess champion at the time. "The difference is that chess is a game of perfect knowledge, meaning there is nothing hidden from the players. In poker you can't see your opponent's hand and you don't know what cards will be dealt. This makes poker a much harder challenge for computer scientists from an artificial intelligence perspective," Schaeffer said.